7 “You brood of vipers! Who warned you to flee from the wrath to come? 8 Bear fruits that befit repentance, and do not begin to say to yourselves, ‘We have Abraham as our father’; for I tell you, God is able from these stones to raise up children to Abraham. If we look at the Gospel story with other historical sources of the period (in particular Josephus and the Qumran documents), we can see that John was part of a deep spiritual ferment pervading the whole of Judea at that time. John’s activity was concentrated in the Jordan valley, but we don’t know exactly where. It was either at Beth-abara at the fords of the Jordan near Jericho, or higher up the river at Aenon near Salim, south of Scythopolis (Beth-shean). Among the multitudes who ﬂocked to be baptized was Jesus, who came from Nazareth in Galilee. This was the beginning of his ministry. According to the Gospels Jesus’ baptism was followed by forty days of seclusion in the wilderness, most probably the wilderness of Judea above Jericho. This has from time immemorial been a refuge for those who wished to isolate themselves from the world. The sequence of baptism and seclusion in the wilderness was common at the time, especially among the Dead Sea Sect, whose headquarters were at Mesad Hasidim (Khirbet Qumran) not far away. No concrete evidence has, however, been found to connect John or Jesus with the sect. Gospel tradition has it that Jesus was tempted by Satan in the desert and carried by the evil spirit to the ‘pinnacle of the Temple in Jerusalem’ presumably the south-eastern corner of the Temple Mount which had a sheer drop of 130 feet. Having overcome temptation, Jesus returned to Galilee. John continued to preach and baptize and was ultimately arrested by order of Herod Antipas, kept in prison for some time (traditionally at Macherus in southern Perea). and executed when Herod succumbed to the wiles of his wife, Herodias, who hated the prophet because he denounced her marriage to Antipas (she had previously been married to his brother (Mark 6: l4-29; Matthew l4:l-l2; Luke 3:l9-2O). 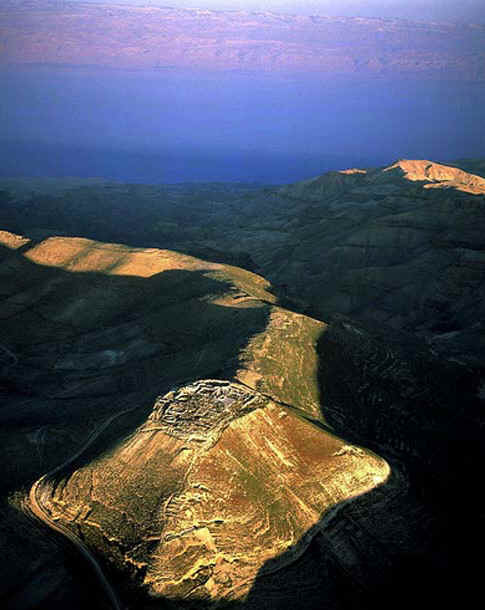 is a ridge built by King Herod the Great to bring fresh water to the people within the walls.